Marketers segment their markets so that they can better target the customer groups that offer the greatest sales potential. This also helps them refine brand messages for each group. 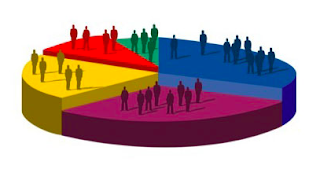 Markets can be segmented on product usage, purchase behavior, benefits, price, life stage, cohort group, psychographics, geographics or geodemographics. In many product categories, there are price sensitive, convenience driven, brand loyal and category enthusiast groups. One way to segment markets is based on specific attitudes, values, beliefs, lifestyles and self-perceptions. The market researcher uses qualitative research to uncover hypothesized attitudes, values, beliefs, lifestyles and self-perceptions associated with heavy or loyal brand or product usage. These attitudes, values, beliefs, lifestyles and self-perceptions are translated into statements that can be tested against product/brand usage in a quantitative brand segmentation study. Once these statements are validated, they can be used in all subsequent research. I wish you great success in finding and appealing to your most promising customers. For more information on market segmentation, refer to the "Understanding the Consumer" chapter in Brand Aid, second edition. if you get want great opportunity than you can visit this site.